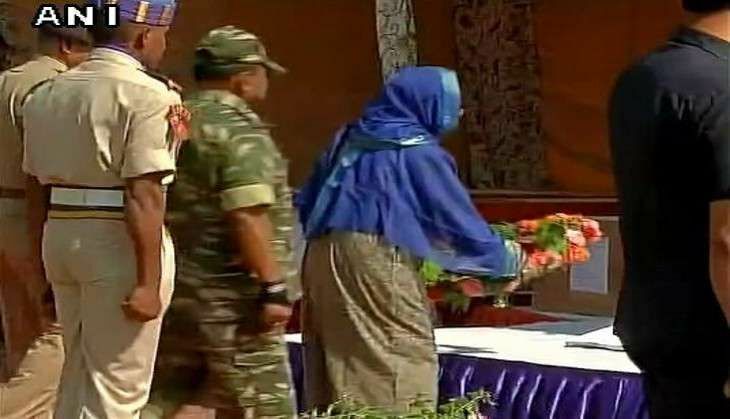 Jammu and Kashmir Chief Minister Mehbooba Mufti was among the dignitaries who paid floral tributes on 26 June to the eight CRPF jawans who lost their lives in a terror strike in Pampore on 25 June. Two armed militants armed with assault rifles killed eight CRPF jawans and wounded 23 others. Mufti strongly condemned the militant attack. "The only purpose of such blood-spattered acts of violence is to add to the tragedies and miseries of the people and subvert the government's efforts aimed at bringing permanent peace and prosperity to Jammu and Kashmir," she said. She added, "I would like to express my sincere condolences to the families who have lost their loved ones in today's dastardly militant attack." Prime Minister Narendra Modi also expressed pain over the death of eight CRPF personnel in a terrorist attack in Jammu and Kashmir on 25 June. I salute the courage of the CRPF personnel martyred today in J&K. They served the nation with utmost dedication. Pained by their demise. My thoughts are with the families of those martyred today. May those injured recover soon. Home Minister Rajnath Singh also offered his condolences to the kin of the martyred jawans. "Deeply anguished to learn of the death of CRPF personnel in an ambush at Pampore in Jammu and Kashmir today. My heart goes out to the families of the CRPF men who lost their lives in Pampore. I also pray for the speedy recovery of the injured," Rajnath said in a series of tweets. In what is being called one of the most deadliest attacks on security forces in recent years, 23 CRPF personnel were critically wounded when terrorists rained bullets on the bus carrying them at Pampore, near Srinagar, in what appeared to be a Fidayeen attack carried out by Lashkar-e-Taiba.